PLEASE NOTE: There is a 1-2 week lead time on this item. The WF series frost top provides the most attractive way of display your pre-plated cold foods. The unit frosts over quickly, providing a bed of snow - the perfect setting for salads and desserts. The drop-in pan can be installed in virtually any counter and can be provided as fully self-contained - just plug it in and turn it on. The pans is fully insulated for maximum efficiency and energy savings, and is provided with a factory applied gasket so that it can be installed in the finest wood fixtures without marring the counter top. The frost top is constructed of stainless steel and stands 1" above the counter top for an eye-catching display. When turned off, the condensate melts into the full perimeter gutter, sloped to a 1/2" drain. 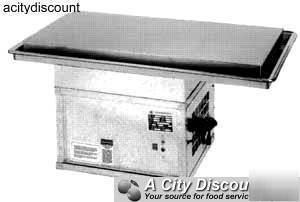 These units have not been performance tested for use with potentially hazardous foods!!! * Fully insulated for maximum efficiency and energy savings. * Factory applied gasket - makes installation a snap and seals units to the counter top, thus eliminating seepage. The flange measures 24"W X 71"D and has a pan opening of 22 1/4"W X 69 1/4".